Graying corporate boards are getting lessons on how to foster the next generation of directors. Younger directors remain rare but they’re increasingly in demand for their skills and perspectives on topics such as cybersecurity, e-commerce and marketing to millennials. They can also bring diversity to otherwise “pale, male and stale” boardrooms. Kerstetter’s board education platform launched late last month a new initiative with Nasdaq and executive search firm Spencer Stuart called Next Gen Board Leaders. The project is meant to help boards learn how to recruit and assimilate younger, often first-time directors. 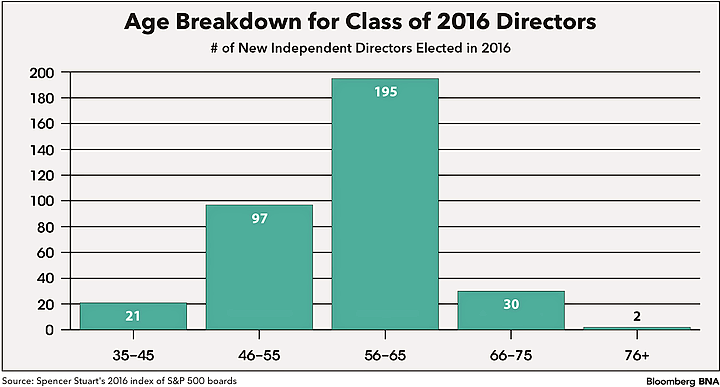 Directors have gotten older amid rising retirement ages. Over the past decade, the portion of S&P 500 company boards with an average age of 59 or younger has been cut roughly in half while those with an average age of 64 or older have nearly doubled, according to Spencer Stuart’s most recent board index. Boards in between, with average ages of 60 to 63, have stayed at about the same portion between 2006 and 2016. That’s not because of a lack of demand for younger directors. “We are seeing boards interested in younger directors,” particularly when they’re looking for experience in technology and other areas that older directors might lack, Julie Daum, who leads Spencer Stuart’s North American board practice, told Bloomberg BNA. But Daum said “boards have slow turnover, so you’re not going to see quick change because of that.” Conversations about turnover are changing though as boards think more about refreshment and rely less on retirement, she said. With a potentially decades-wide age gap between sitting directors and incoming directors, making new board members feel welcome and bringing them up to speed on their new roles becomes even more important. One thing that can help is having a “board buddy” that can act as a mentor for a new director, Caroline Tsay, a 35-year-old who sits on the boards of Morningstar Inc. and Rosetta Stone Inc., told Bloomberg BNA. “I think sitting board members expect that you can participate from day one and know what’s going on,” she said, likely because many of them have been on boards before. This year, S&P 500 boards have seen the biggest influx of first-time directors since Spencer Stuart started tracking such data. Next Gen Board Leaders says too many boards lack effective on-boarding practices for new members. So that’s one of the issues Tsay and nine other public company directors in their 30s and 40s will tackle as part of a first-of-its-kind advisory council. The council, which met for the first time June 27, will swap stories and share tips on opportunities and obstacles that current and aspiring board members of younger generations face.